lying on the East End of that Lott. "Suffolk County (Massachusetts) Probate Records, 1636-1899," on 439 FHL US/CAN microfilm reels, FamilySearch (https://familysearch.org), : accessed 19 October 2017),"Probate records v. 54-55 1758-1759," FHL US/CAN film 493,876, Volume 55, pages 160-161 (image 396 of 473), John Plimpton division and appraisal, 1759; citing original records in the Suffolk County, Mass. courthouse. John Plimpton (1708-1756) died 8 May 1756, and his widow, Abigail (Fisher) Plimpton, and eldest son, Amos Plimpton, were appointed administrators of his intestate estate on 2 July 1756. In Part 1, three appraisers were appointed to make a true and just inventory of the estate, which they did on 20 October 1656. The estate was valued by the appraisers at £375 : 4s : 3d. It included real estate valued at £ 264 : 16s. The personal estate was £ 110 : 8s : 3d. In Part 2, the administrators, widow Abigail Plimpton and son Amos Plimpton, declared their account, which totaled £70 : 4s, on 22 October 1758. This included fees and charges for the probate court documents, notes and money owed to creditors. In this document, the appraisers divided the real property and set off one third of it to the widow, Abigail (Fisher) Plimpton. They appraised the remaining two thirds of the real property at £189 2s 8d. However, they did not divide the property between the children of John and Abigail Plimpton because it would "prejudice" the division. Apparently, they did nothing until all of the real estate could be divided after Abigail died and her thirds reverted to the rest of the estate. John and Abigail (Fisher) Plimpton are my 6th great-grandparents, through their son, Amos Plimpton (1735-1808), who married Mary Guild (1735-1800) in 1756. Note that these records are on FHL Microfilm, and are on FHL digital microfilm on FamilySearch.org, but they are not indexed. The Suffolk County Probate Packets have not been filmed to my knowledge,so I used the Suffolk County Probate Court Clerk volumes because I found them first. A researcher has to search the Probate Index for the person's probate packet number, then find the Probate Docket files with the list of papers that are in the probate packet, along with the volume and page numbers, and then find the individual volumes and pages with the documents listed in the Probate Docket. 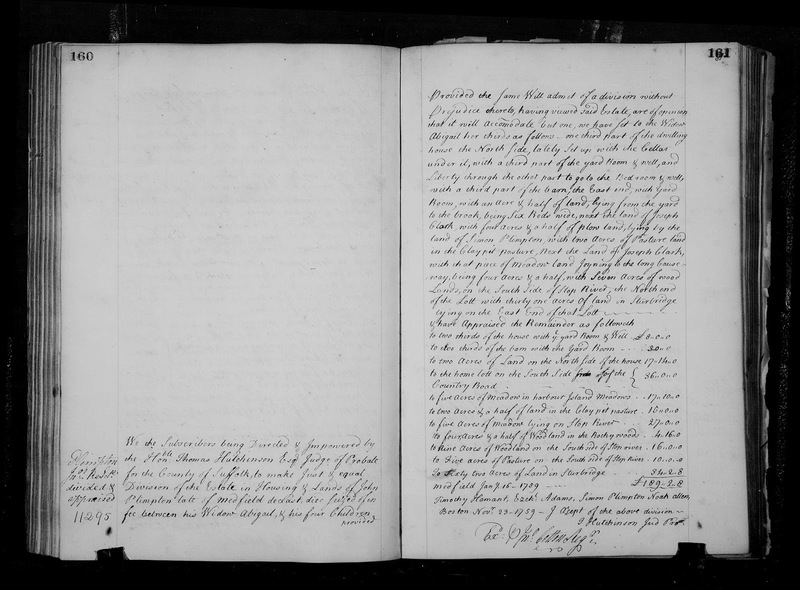 This set of court clerk volume records are not indexed on Ancestry.com in the "Massachusetts, Will and Probate Records, 1635-1991" collection. They are available in the Ancestry collection, but you have to use the Probate Index and Probate Docket files to find the volumes and page numbers (similar to the process on FamilySearch). They just are not indexed with the correct decedent's name. There will be several more posts for this set of estate records.